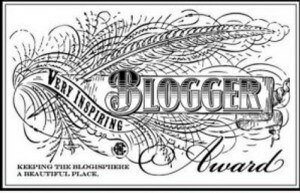 I just received the Very Inspiring Blogger Award from the very talented and wonderful Al Diaz over at http://fatherdragon.blogspot.com. Al is new to blogging and he can really do with a few more blogger friends. Thank you for the award Al! 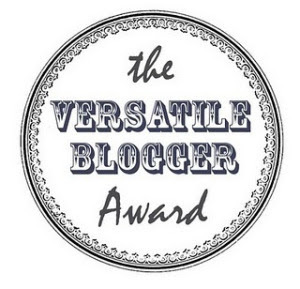 I also received the Versatile Blogger Award from the equally talented and awesome Linda King over at http://excusemewhileinotethatdown.blogspot.com/. Thank you so much Linda! 1. I want to get another tattoo, hopefully still this year, as the one I have feels lonely. 2. I am a lacto-ovo vegetarian. 3. Most of my writing gets done really late at night, because I find it hard to really focus during the day. 4. I am not a morning person, at all. 5. When I was 23, my sister and I lived in New Zealand for three months. 6. I get along with animals a lot better than I do with people most days. 7. I am so much of an introvert sometimes that I tend to isolate myself from family and friends for weeks on end. Now, for passing these awards along...I hate picking favourites, so I am just going to post these awards on my blog for anyone to claim, if they want it. Congratulations on the awards. I'd love another tattoo too, but I'm waiting for inspiration to strike. I hope you don't have to wait too long. Annalisa - Thanks! I am actually saving for it right now. Let's face it - most animals are just easier to get along with. Interesting facts. :-) Congrats on your awards. I'm slowly becoming more isolated too. Partially because I can't find people who share my interests or who realize they need to respect mine like I do theirs. Al - Thank you. I love the smell of bbq. Vegetarian food never smells like anything, or at least the ones I eat. LD Masterson - So very true, I find that out everyday. Misha - Thank you. I completely agree with you. Most times it is hard to find someone to whom one can relate and other days, you just meet people that don't want to understand. Nice awards.You deserve some nice awards. I just read your post that you quit your job. Now you can be creative and create your own job. I know several women who did just that. Good luck. Manzanita - Thank you! Your words are so welcome and comforting. Congratulations on your awards, Murees. And thanks for stopping by my blog and commenting. As you know, I am an animal lover, so can appreciate how much you like animals. PS: My husband and I are vegetarians, too. Some really good veggie food is Indian food, and it smells wonderful as it cooks! Thank you, Murees, for stopping by my blog and commenting. I see you made a big change by quitting your job. Bet there's something special for you not so far in the future. Good luck. Elizabeth - Thank you and I should definitely try Indian food. I truly wish you and your family the best. Monti - You are so welcome and thank you for your kind words of encouragement.